This verse from the bible is familiar and powerful. If you read the whole passage, the message encourages us to help and get along with each other, pray constantly, and be at peace. Finding gratitude no matter the circumstance is a hard thing to do, especially when times are tough. 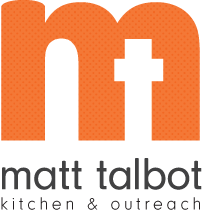 But at Matt Talbot Kitchen & Outreach, we see this from guests every day as they greet a staff member or fellow guest with welcoming words, express appreciation to a hunger relief volunteer for a warm nutritious meal, or write a letter thanking MTKO for the services they were provided during the time of their homelessness. Due to hunger, addiction, poverty, or homelessness, our clients are facing bleak times. Yet they find ways to give thanks regardless of their circumstance. Of course these folks aren't thankful or cheerful all the time. But I am inspired by the overall gratitude we see among our guests, and blessed to witness their example of giving thanks even in very difficult times. This season I am thankful for a supportive community, generous volunteers and donors, and the opportunity to serve. A team of volunteers will be providing a traditional feast for Thanksgiving again this year. Everyone is welcome! Please make a donation this season, and give what you can to help us continue to provide hot meals and homeless prevention services to those most vulnerable in our community. Thank You. Two simple words that, no matter the circumstance, change everything for the better. p.s. It has been a record setting year so far – we have provided nearly 6,000 more meals compared to last year at this time. p.p.s. Send your gift today. The hungry and homeless are counting on it – and are truly thankful!